So when I left you in the previous post we had just arrived in Barcelona and finished our trip to Park Güell. Of course by this time we were starving! We decided to try out a restaurant I had seen featured on many Barcelona sites and also had been recommended to me for some authentic tapas, which was Tapas 24. Tapas 24 was so good that it deserves a post to itself and we also ended up here twice in a 3 day trip, so that pretty much speaks for itself. 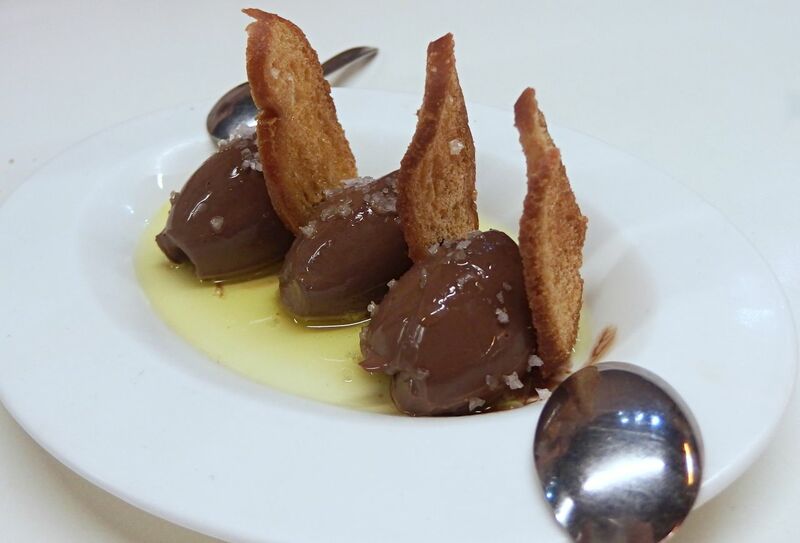 The restaurant is owned by renowned Catalonian chef Carles Abellan who is the owner of his own Michelin star restaurant, however this is definitely not Michelin star prices and the food is amazing, it probably is one of the best tapas I have ever had. When we first went it was around 5pm so it wasn’t too busy and got ourselves a nice spot on one of the high-rise tables. It’s like a real tapas bar where everyone sits together, relaxing and enjoying the food and wine. But when we went earlier on our last day, it was much, much busier and on previous nights when we walked past there was always a queue so we thanked ourselves lucky for that first visit! You can’t book but it doesn’t take too long to wait for a table to be honest. Location it’s based off from the Passeig de Gracia which is one of the main shopping streets and was in walking distance from our hotel. As this was our first restaurant in Barcelona and also by a top chef, I was expecting it might be really expensive but it is not at all. I was stunned by the €3 wine prices, I ordered a glass of white and Danny got some Cava, they were both delicious. It’s crazy as here in London you will be lucky to get a glass of wine for less than £6-7 and you have many options, mostly of which I’ll never choose the house wine. But here I had no idea what I was getting but it was delicious! 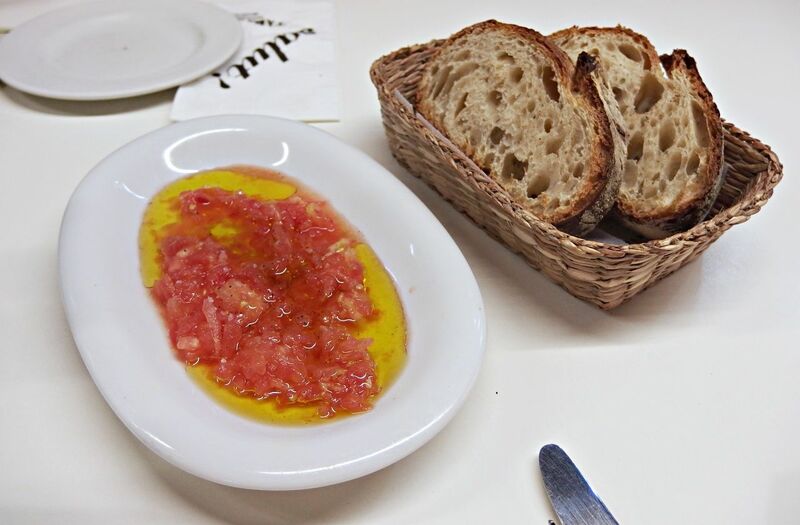 The tapas is most certainly different, there is some of the usual types of tapas such as the tomato bread and ham, oh the ham! 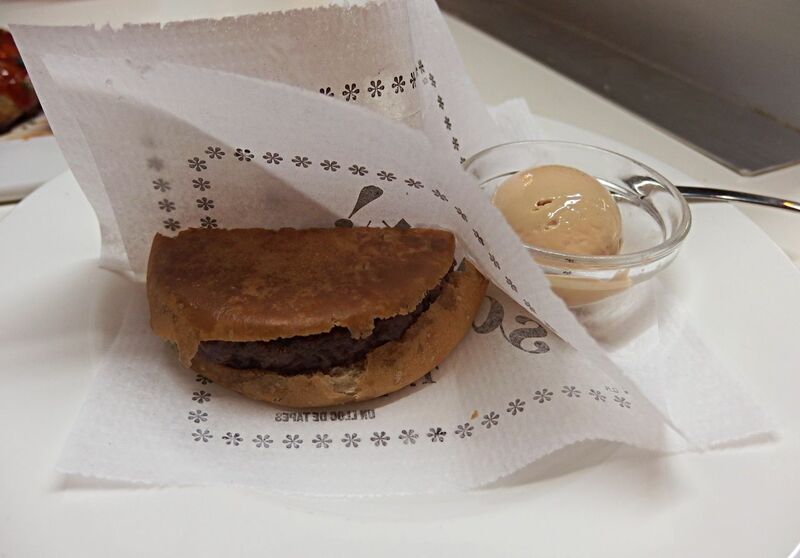 But you can see they have been so well thought out, I even tried black truffle and foie-gras for the first time – where have I been!? I know but wow, I loved both. 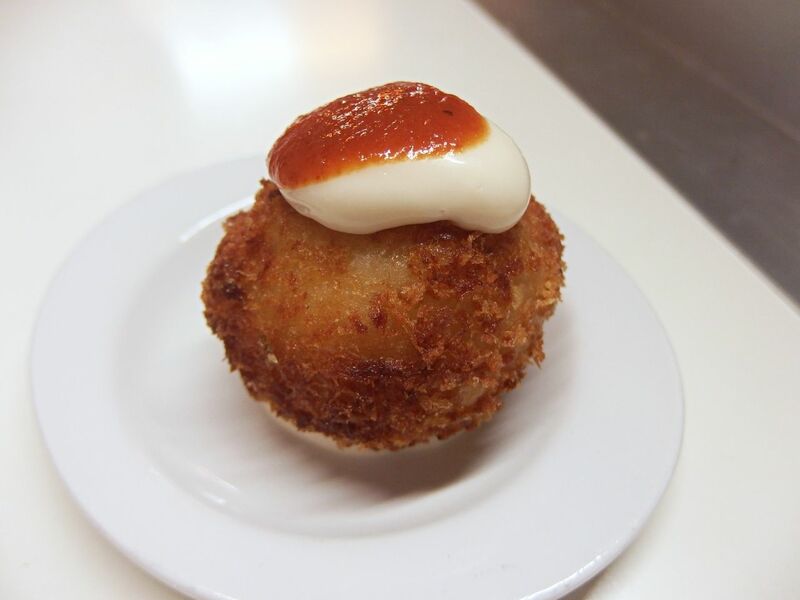 The best thing about tapas is you can just keep ordering more until you cannot eat any more. 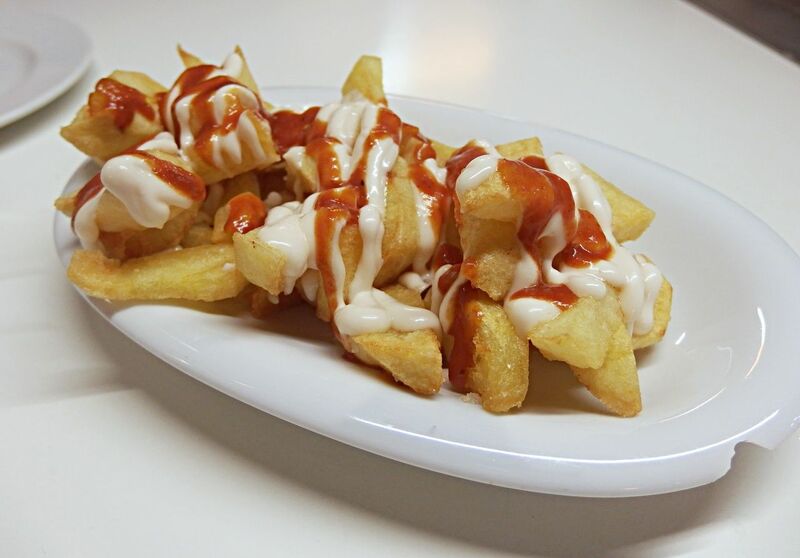 Here are some of the favourites… Bravas, these were different from the usual, they were more on the verge of some really amazing chips with garlic mayo and some sort of spicy bravas sauce, very, very addictive! 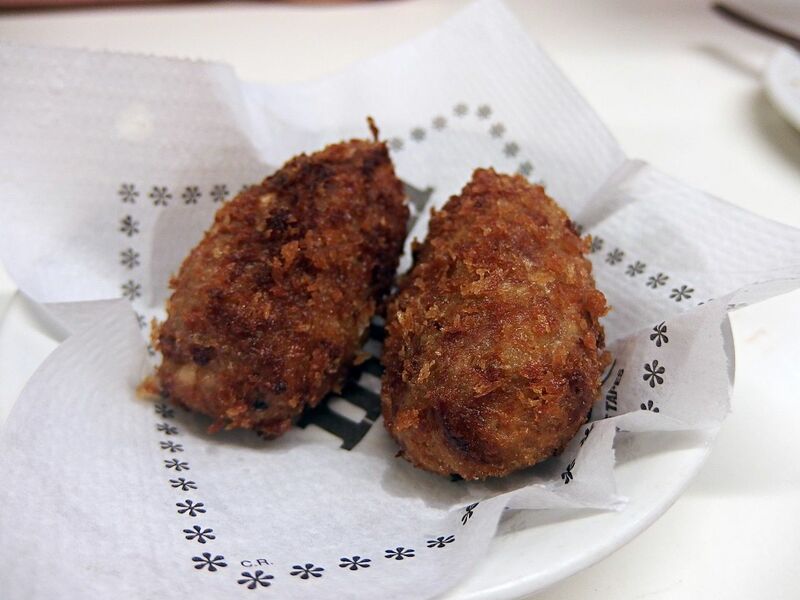 I was so addicted to these chicken croquettes, oh my goodness, they don’t look like much here but inside was like a pulled chicken, so, so delicious. I couldn’t stop ordering these! The menu we had, also had English translation, but there was some specials on the board that did not. 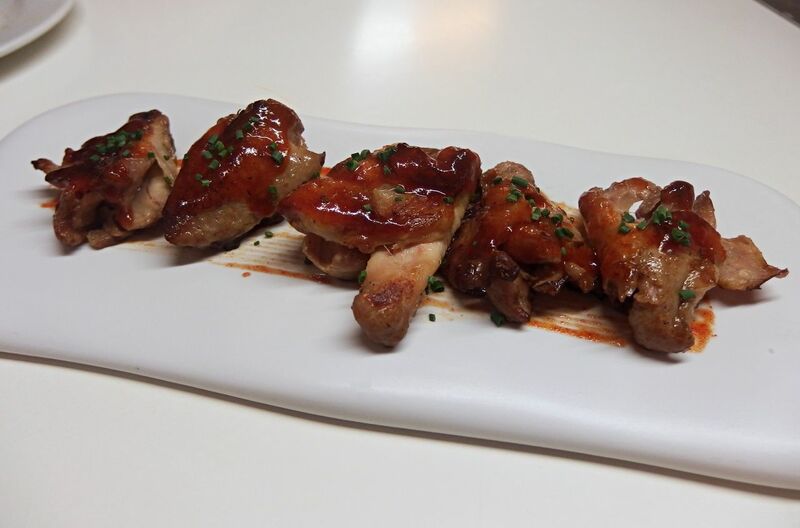 So when I overheard the words chicken wings, I ordered some to see and then these came, little mouthfuls of boneless sauce covered chicken, yummy! I ventured into new territory by trying the McFoie burger, a mini beef burger with a pot of Foie Gras on the side and also the mozzarella and ham sandwich with black truffle, both were really nice! The meatball with sauce looked like a mini santa hat and the tomato bread was again perfect. We also ordered a big plate of ham which I forgot to take a picture of, I blame the wine! Desserts we decided to take a random pick and we ended up with a sort of chocolate ice-cream/parfait in olive oil, covered in salt with biscuit/bread, I really wasn’t quite sure what it was. It weirdly tasted pretty nice, but not sure I’d order it again, it’s definitely an unusual one. Tapas 24 is such a great tapas restaurant if you want to try some amazing dishes and not break the bank. We ordered so much, including wine and it was all in about €60 I think for both of us. 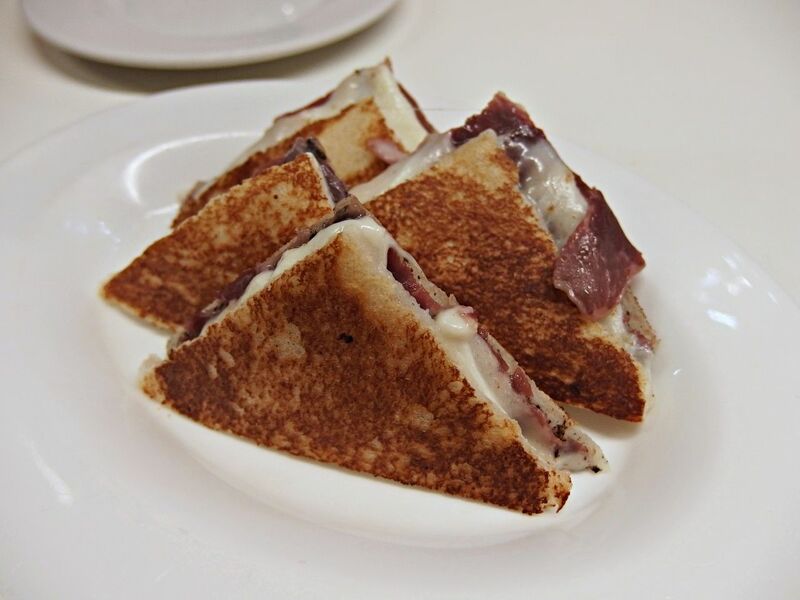 The only dishes that charge a bit more are the Iberican ham which is completely worth it. Now I’m craving all of this again and I’m sorry if you are too!